If you’re just getting used to eliminating gluten from your diet, it may feel like a burden to remove dairy as well—especially if you’re a fan of comfort foods like cheese and ice cream. Why exactly do many practitioners recommend a gluten- AND dairy-free diet to patients diagnosed with celiac disease and non-celiac gluten sensitivity? The Gluten Free RN is walking us through the similarities between gliadin and casein, explaining how the proteins found in gluten, milk and cheese impact our brains. She discusses how Marsh 1 damage from celiac disease leads to an inability to break down the sugar in milk and why we crave the very foods that are making us sick. Nadine shares the story of a young man with autism whose health improved once his family went gluten-free, describing the well-documented gut-brain connection and how the right high-fat diet can repair the neurological system. Listen in for the Gluten Free RN’s insight around dairy replacement options and get empowered to reclaim your health with a gluten- and diary-free diet! Nadine is a 'food is medicine’ activist and is very proud of her work to educate all people about the power of food in health and wellness. Nadine is an expert consultant, professional speaker with over 1500 lectures to date, author of DOUGH NATION: A Nurse's Memoir of Celiac Disease From Missed Diagnosis to Food and Health Activism, podcaster, mom and former emergency/trauma/critical care nurse. 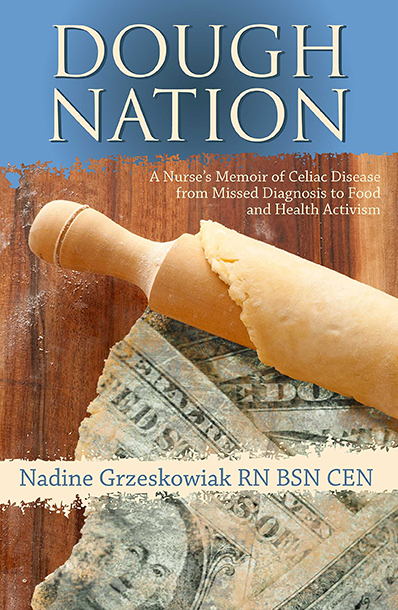 Nadine is co-authoring her next book on the science of celiac disease. This is a very good article!